Woah everyone! The last month has been a house hunt/ home buying whirlwind. After a couple of intense weeks of house hunting, we were under contract and moving fast through the home loan process. Needless to say, that was sucking up any “extra” time this gal had. Sadly, that meant this new blogging adventure fell behind. I am briefly feeling some relief among the madness and want to catch you guys up! We drove neighborhoods to check the yard size, home exterior, and area beforehand. That crossed several off our list that we did not have to waste time at an Open House. Here are a few tools that I loved, some of our thoughts, and a couple of things I will do differently next time. First, I took some helpful checklists I found on Pinterest. Here are a few of them. From Sunshine and Rainy Days , click through to download her printable. Don’t you LOVE the layout on that one? Visually, it looks great and is very concise. 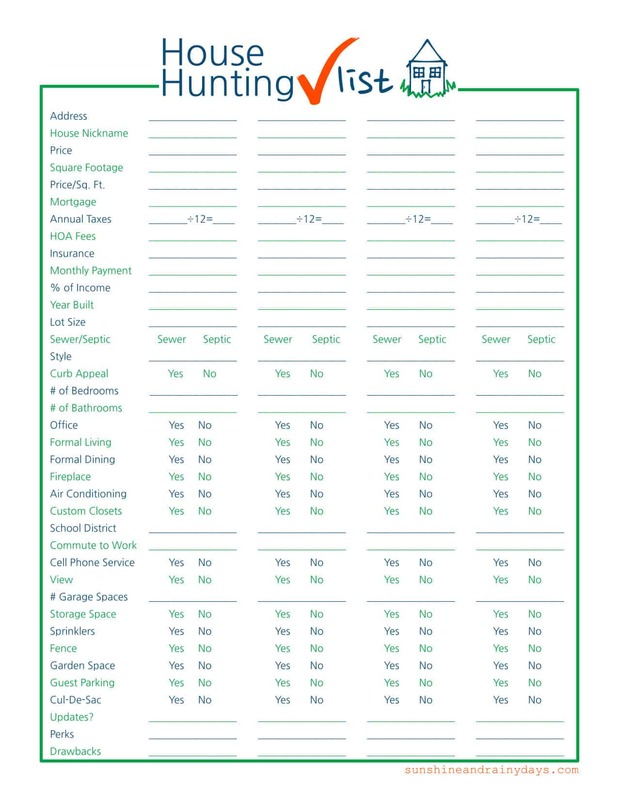 I really planned to create my own checklist, but I’m sure if it doesn’t look better than this I will just toss it… I really appreciate that Homes.com! Anywaaaayyy…. We used them while still inside the home to help remind us of details we may have otherwise overlooked. Some of the questions we filled out while there, and others we completed after in the car or later at home. They helped us to remember super important things like checking outside foundation and driveway for cracks, or that doors open and close properly. When you walk through the home, all doors are typically open, and you could miss that some may not function correctly if you don’t intentionally check. Checking inside cabinets underneath sinks for wet spots or mold is good too. Go on and turn on those water faucets and flush the toilets while you are at it. These items could be easily forgotten for many (like myself). I found that I focused on the aesthetics and functionality of the layout. In the moment, I am not thinking at all about the foundation, water works, door hinges, etc. Therefore, I greatly appreciate the help of these checklists to keep me focused on all the important parts. When you visit each home, you typically receive a One Sheet on the home details and hopefully even the Seller Disclosure Form listing any current problems and even fixed problems. I stapled them all together with the checklist I completed, and then I tucked them into my handy pretty folder with the houses to review later. The finance/comparison form from Sunshine and Rainy Days was great once we narrowed down our search. Quick comparison of all the expenses including the utilities and extras like trash and HOA fees was key to knowing which homes stayed within our comfortable budget. Noting the commute times was a bonus too. Do not take kids. Duh. Simple as that. No matter how lovely my kids are, they are a distraction and make it crazy hard to focus on the very important details. If you are house hunting and have other tips for me or checklists that you love, please message me or comment below! I would love to add any other helpful info here. Two easy ways to save this post are to Share it your facebook page and Pin it on pinterest! Quick links at the bottom of the post. More posts coming soon about the rest of our house hunt, making our decision, putting in our first offer and realizing that the whole thing was more stressful than we anticipated! Follow the blog and like our Facebook page to keep up. I’m hoping to get back on a post schedule and not go MIA again. We may be moving next week, so we shall see how that goes….